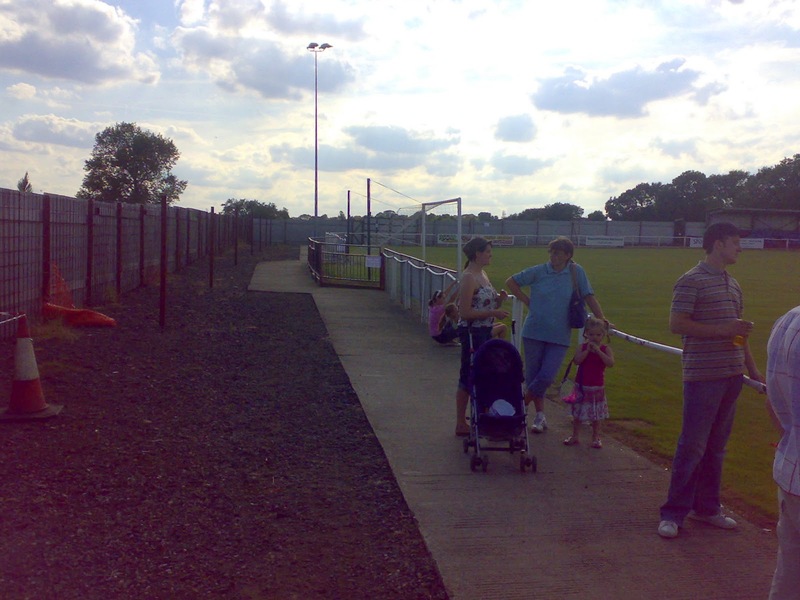 Teversal FC are a non league football club based in the small village of the same name near Mansfield in Nottinghamshire, right in the heart of the old mining area. 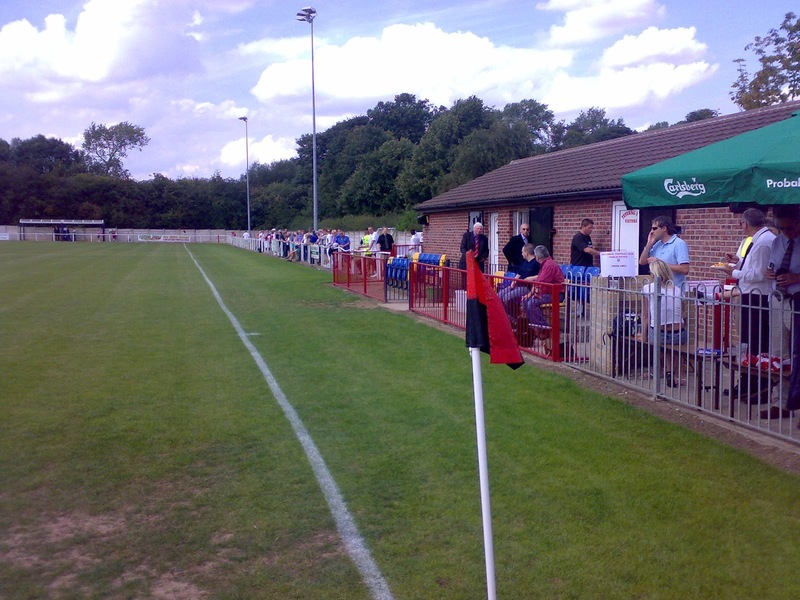 The football club were originally known as Teversal Miners Welfare FC and were formed in 1918. Over the years the team dropped down to youth level, before it was re-established in 1986 under the name of MW Teversal FC and playing in the lower divisions of the Central Midlands League. When the nearby collieries of Teversal and Silverhill were closed not long after, there was an air of uncertainty hanging over the club as the Carnarvon Street ground was part of the complex. Ashfield District Council stepped in and took it over re-naming it the Teversal Grange Sports and Social Centre. 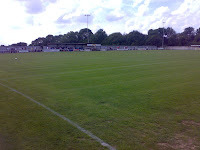 The club followed suit and changed its name to Teversal Grange FC in 1989, and then joining the Notts Alliance two years later. 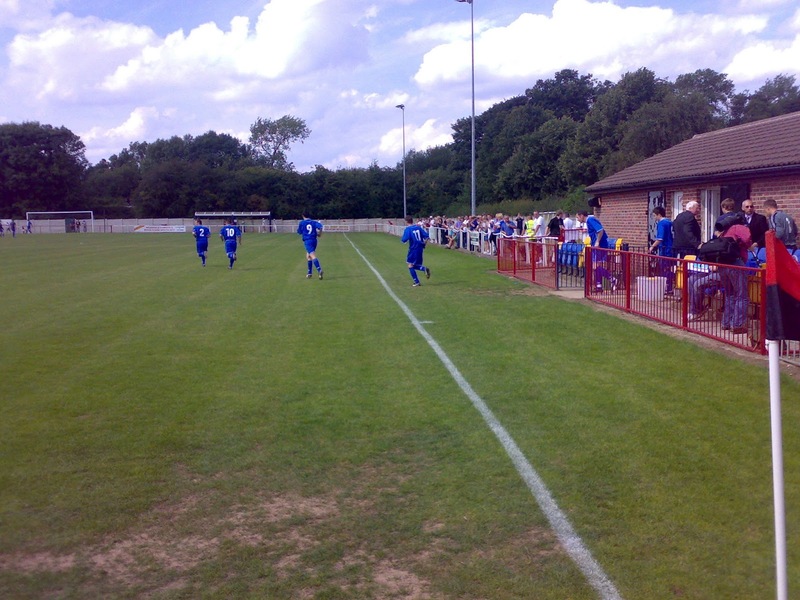 After six seasons they rejoined the Central Midlands League. 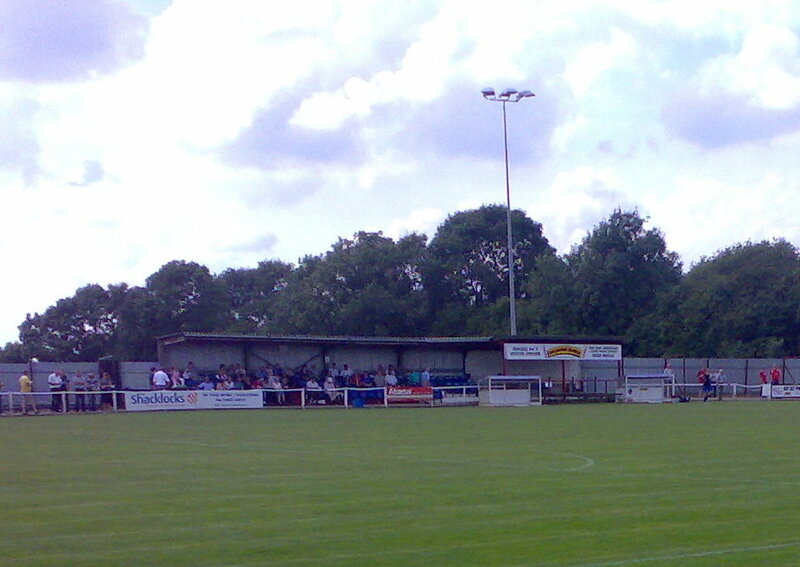 In 2000 the club changed their name once again to their present title and a year later they reached the leagues' Supreme Division after facilities were upgraded. 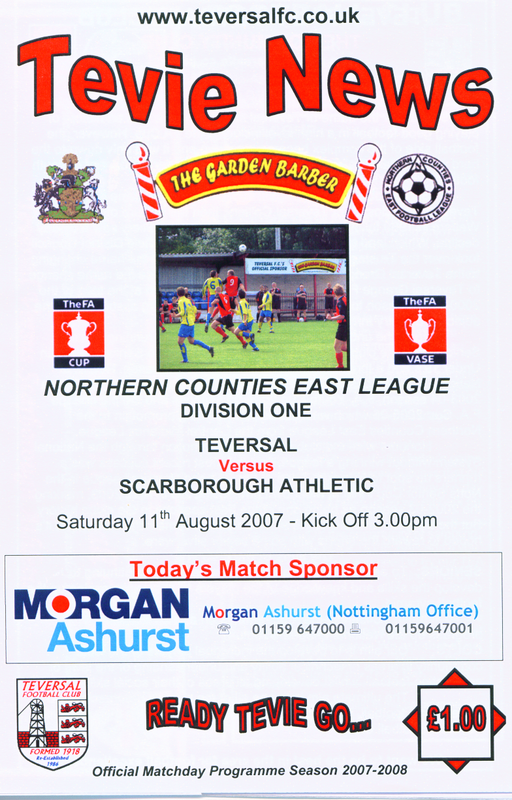 Another promotion followed meaning Teversal commenced the 2006-07 in the Northern Counties East League. Teversal FC will play in the Northern Counties East League Division One for the 2013-14 season. 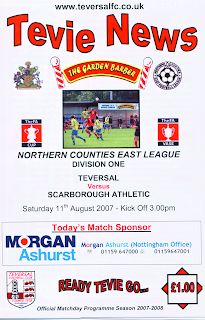 Scarborough FC went bust in June 2007. Within a couple of weeks Scarborough Athletic FC were born through the prudent planning of the Seadog Trust. After some real scares and a lot of very hard work the club were placed in the Northern Counties East League. We were just grateful to have a club to follow, but one of the main realisations of where we were came when the fixtures came out. We knew fully well that the grounds we would visit would not be of the standard the we were accustomed to, and some of the standard of play would be lower, although a loyal fan told me he could count the amount of good games he'd seen in the Conference over the previous few years on the finger of one hand. 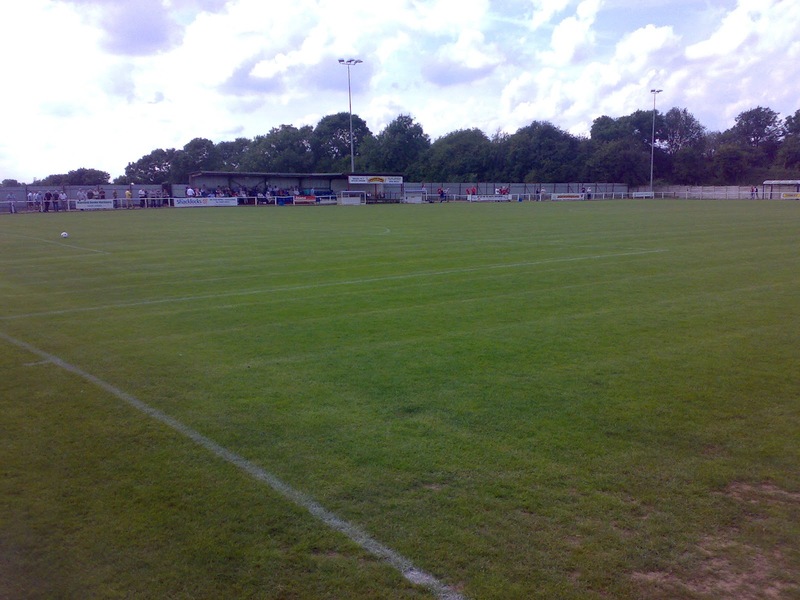 Boro were drawn out to play their opening league game away to Teversal, which started a search on google maps and Wikipedia to try and glean information about the club and where it was. Little did we realise we'd passed withing a couple of miles of the place on the M1 heading to the likes of Fulham. How things had changed! Dave Cammish, an old pal of mine from Scarborough now lived down south so we arranged to travel to the game with him driving. For reasons tha can never be described I had a big Friday night before awakening on a scorching day to head to Sawbridgeworth for my lift after some breakfast. I must have looked like I was heading to a wedding as I was in my suit. Boro fans had decided to travel looking like businessmen as an acknowledgement that all members of the Trust were equal owners of the football club. We set of with Dave's three year old son Ashley with us, asking the questions three year olds do, especially on long boring car rides. We travelled up the A1 and intended to cut across south of Mansfield. We managed this after my map reading skills had let us down and travelled past the home of Rainworth MW before eventually entering Teversal. We parked up and went inside the Carnarvon Arms so I could enjoy a 'hair of the dog' and Ashley could exhaust us in the playground. 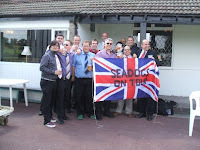 We drove up and parked in the already busy park behind the ground and then set off to meet up with the other Seadogs, many of whom were enjoying a beer in The Teversal Grange. 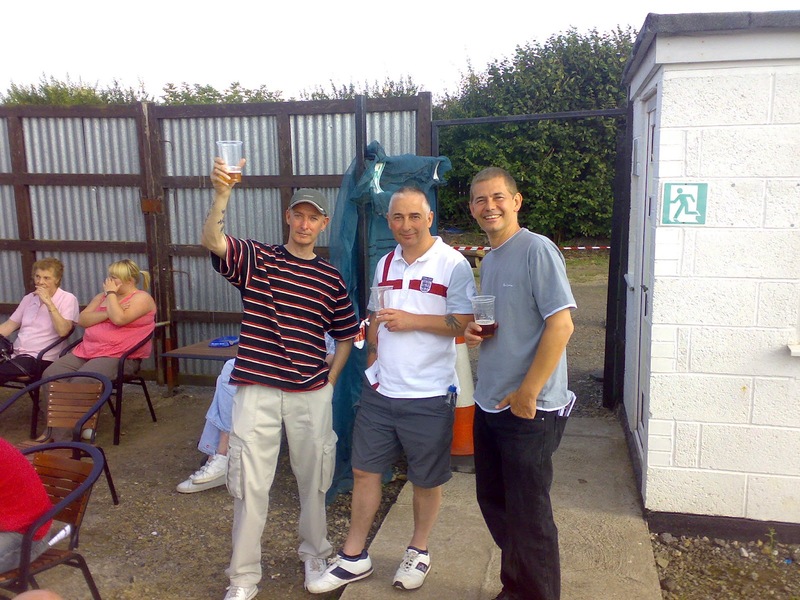 We went out to the back of the pub where there was a cricket game in progress. A poor batsman was dismissed for a duck when run out at the non strikers end, much to the amusement of the crowd who did their best to hide their giggles as he returned. It was then time to enter the ground. Teversal had done a fine job on putting on our big day, with over three hundred Boro fans making the journey. The ground was neat enough with flat open standing at the turnstile end. 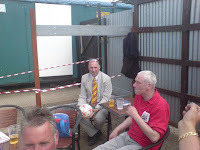 In the corner by the changing rooms was a small bar and refreshment counter with tables and chairs outside, much to our joy. 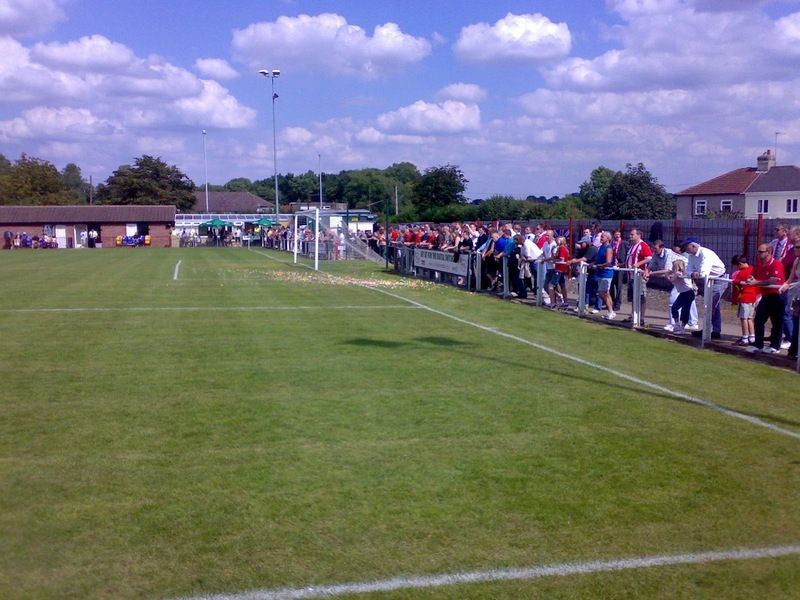 The far end was similar, save for two covers that formerly saw service as Tesco trolley shelters. The touchline to our right was open flat grass and hard standing with the dug outs on the half way line. 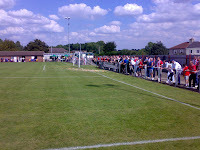 The opposite side was similar with a seated stand on the half way line. 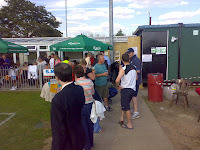 We enjoyed our drinks while chatting about an extremely eventful summer until the teams came out to a tremendous reception. I must admit to feeling very emotional. The teams pre season had gone well, and I fully expected us to win promotion at the first attempt, like many of the fans. How little we knew! Teversal were like many other sides we were to face in that first season. They were fit, physical and organised and could play a bit as well. Our lads looked like they had been a month earlier; strangers. We were not making too much impression going forward although Craig Hogg impressed me. 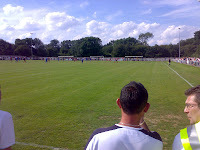 The Tevie Boys took the lead after just nine minutes when Dean Short broke through the static Boro defence to lob the ball over Dave Bramley in the away goal. I spoke to many friendly locals and thanked them for their hospitality. We hoped that Darren France would work the oracle at half time after a fourty five minutes that could have seen Boro at least three down. His Dad, Brian who was team manager was still abroad on holiday. Reality was really kicking in! Five minutes into the second half local lad Dave Thompson wrote his name into the record books by scoring Scarborough Athletic's first ever goal in a competitive fixture when he slotted home. 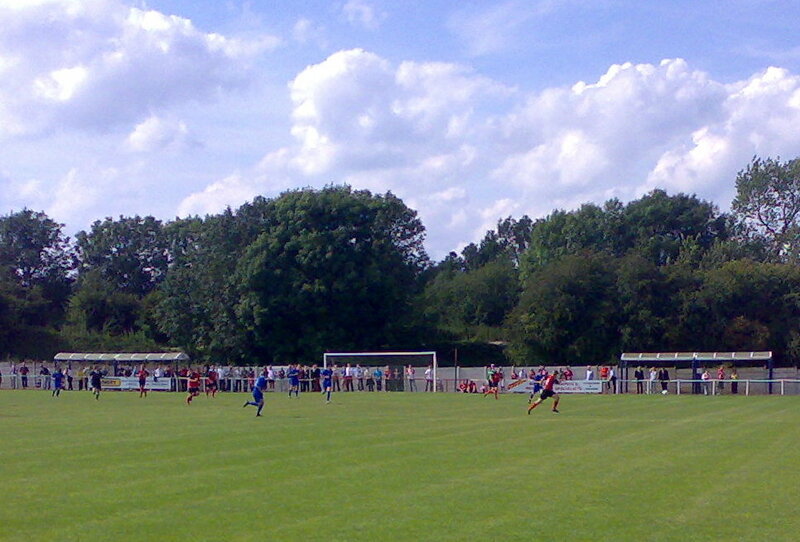 Boro continued going forward but they could not forge a clear opening. In the searing heat they began to run out of energy as Teversal came back into it after weathering the storm. They won a series of corners and then pounced through Gavin Short who smashed in a close range volley following a corner in the eighty ninth minute. It was just like following the old club! We applauded the team off, most disappointed although as I write this report a few years later and read our line up we probably did well to lose the way we did. 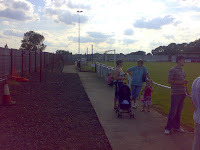 We headed out and joined the unusual queue of cars for a game at the ground and headed our way back down south. I cheered myself up by playing with Ashley in the back of the car. There's something about youngsters that cheer me up even when skies are grey. I got home tired and dispondent but by the following morning I couldn't wait for the next Saturday when I was heading to Leeds for a stay and to go to Boro's away game to Leeds Met Carnegie and my nephew Stanley's naming day in York on the Sunday. Up the Boro. Things could only get better!